This post is part of a series of posts with some of the results from a survey of my top VC-using teachers. Read more about it in the first post of this series. Remember, they are using videoconferencing to support curriculum instruction (not full length courses). Comment on how you select and prepare for a videoconference. 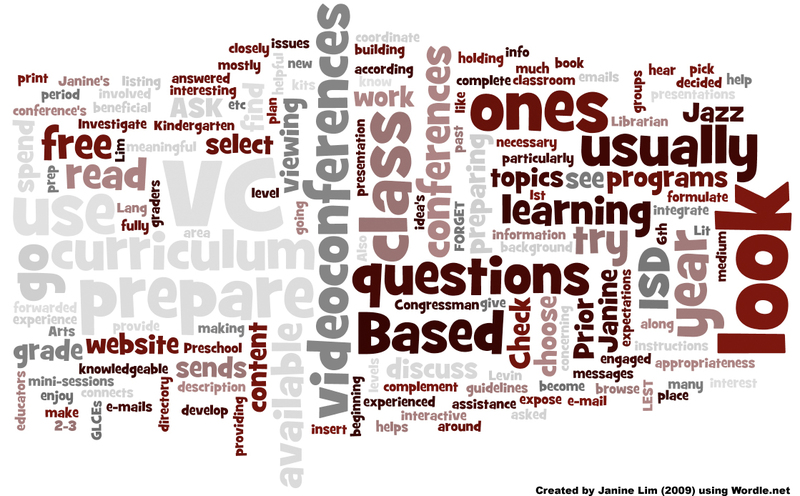 This is a qualitative representation of the results using Wordle. Click the graphic for a larger version. I use the ISD website to search for programs that are available. I go to the teacher who helps us in our building for help. VC Coordinator. I use some of the same ones each year because I know the expectations and the results. I watch for Janine’s emails to see what is new that I can use, and I look for FREE ones. I use the ones I have experienced. Interesting on these repeat comments. What hooked them the first time? There is a print out at the beginning of the year that I try to find things that go with my theme. What is their criteria for choosing? I look for videoconferences that integrate with our learning. Based on our GLCEs / curriculum. This came up again and again in various wordings. Videoconferences that are at my students’ level. I usually provide the students with guidelines and we vote on what medium or type of presentation to give. The students then work in groups to complete the presentations. We prepare according to the instructions, formulate questions, discuss the topics etc. As for preparing, sometimes the ISD sends kits for us to use or I check with the place holding the VC. I expose my students to the information necessary for them to become fully engaged when viewing the decided VC. WE discuss and then prepare questions that can be asked or answered by viewing the VC to make it a much more richer experience. Prior to the LEST WE FORGET conferences I will spend a class period providing background info or reinforcing prior learning of the war involved. We then develop questions based on student ideas of what they would like to hear more about. Your Turn: How do you select and prepare for videoconferences? What resources and strategies do you use to help teachers select videoconferences? How do you help teachers prepare for videoconferences? Please comment! Very Interesting. It almost seems like some are prerecorded but I thought the point was that they were all live. I poll students to determine what interests them. I prepare for videoconferences by printing and gathering all of the presentation materials beforehand. I also make sure that I have all of the login information available so that I won’t have to search for them at the last minute. Being prepared for video conferencing is the key! I like the idea of class votes, or at least class polls. I would definitely go to an expert in the field, perhaps the campus librarian, but I would hope for a district VC expert lurking around somewhere. I would want to video conference live. My students will put together a list of questions and designate one student to be the interviewer. Another student would be the librarian – always ready to research additional questions. Two students would be the runners to assist the class with questions for the interviewer. Grades 3-5 students would run their own VC. I would want to have live interaction. I think the students could get together in small groups and come up with questions and follow up questions (sort of an anticipatory set). I would select my materials ahead of time in order to be completely thorough and efficient with time. I would select the materials I would need for the VC. I would also plan accordingly beforehand and make sure my students are prepared for the material being used in the VC. I would want to use the VC as a review to contribute to what the students have already learned. I do think it would be a great way to introduce learning as well. I agree that you need to be well prepared for a VC. I would want to choose a video conference that was live. I would make sure to preface the VC for the students with background information about the topic/subject/author before tuning into the conference. I would like to have a class period to go over what is expected and especially go over specific art pieces that will be covered through the VC. In preparation for video conference, each student would be given a specific role/job within their group. The material handler would be the student that makes sure everyone in their group has everything they need. The main role would be to select a spokesperson for the group. The group would vote for the topic of choice that they would research. I have initiated preparing for a VC. When I taught 4th grade, our campus ITS sent an email informing the campus about a virtual field trip about chicken eggs. i had to register on Discovery Education and ensure I was able to stream the VC live at the scheduled time. I have not used video conferencing yet but I a positive that it can be incorporated with pre K curriculum. I have not used a videoconference. I would prepare by educating my scholars about the subject matter, gather appropriate reading material and relate other lessons to the conference. I would also ask scholars to write questions about the subject that they may need to be answered by the expert. 1) prepare for video conferences ( printing, presentation materials). Yes, live IVC would be the my preference and one must be well prepped ahead of time. I would use my Tech Support folks to help set it up, ensure students had background knowledge needed, and set student expectations to be achieved. Its important to test the equipment and to have questions ready before you start the VC and go over them with the students so that they are prepared and they is no empty space in the VC. I have not used VC but preparation would be key. Make sure you have the proper connections and any tools you need to make the interactive VC a positive tool. I have not yet had the opportunity to use VC but I plan on using it in the future in my classroom. I believe that planning and preparation are very important to make sure that VC goes well. This includes testing technology to make sure it is working in advance of using it. I choose things that help pull the student’s interest into the lesson. I use what is available and doesn’t cost. I also like having printouts. I have not used a videoconference. I think a teacher would need to prepare about the subject matter, make sure to test technology to make sure everything is working in advance of using it, and to make sure students have all materials needed for the lesson. I would choose videos that align with the content and standards. I like to pole the students and see what they think after I choose a few videos that align with our lesson. I would like to find out whether or not my district is part of this. I would ask my technology aide at our school for suggestions based on what my class was working on in the curriculum. I would go to the school IT’s and ask how to set it up. I think doing it that way would be the best choice for me and what i need to do. Guidance from our IT person or librarian would be an excellent way to get started. I haven’t used this tool to date, but I do intend to use in the future. I would be sure that the conference is available at the time needed, be sure that I am logged in and it is working and have all needed materials before the day begins. Getting background information and building from there and then getting materials ready for video. Having all materials for both sides of the VC. There is knowledge or very specific directions of how to navigate and use the VC. Know how to troubleshoot on the spot with numbers of problems that might come up. Having all relative information and being prepared will add to the learning experience. I would make sure my kids thoroughly understand the topic and work with technology to get things set up. Videoconferences are selected based on lesson objective. Students complete pre-video activity. I have not used video conferencing in my classroom. I would like to though. I have not used video conferencing but this course is peaking my curiosity. I am not very familiar with VC. I would prepare by pre-teaching content, and have my students have questions ready to ask whomever we are VC with. I am not overly familiar with VC, but I would prefer live interaction. I personally have not used it yet, but will make sure everything on my end is working properly first. I have sat in on a videoconferencing and the sound was not working. So I will be sure to check all kinks before incorporating this into my method of teaching or lesson. I always check with our IT department for a list of available IVC programs! I would like to pick something that is on my students’ level and something that is live. Something user friendly would be a great option however it would depend on what equipment is available and approved through the district. Still very new to this and want to continue learning about how to use it in my classroom!